L'Atelier | Chicago's Pipe, Cigar & Tobacco Store | Iwan Ries & Co. 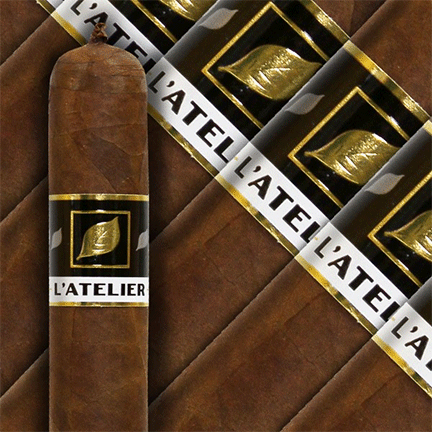 This flagship line, L’Atelier, is made at the My Father Cigars factory in Esteli, Nicaragua. With plans to expand L’Atelier to other blends, this first offering is based on a new wrapper that was grown in Ecuador by the Oliva tobacco family. The wrapper is Sancti Spiritus, a hybrid of Criollo and Pelo de Oro, the “lost seed of Cuba”, and L’Atelier is the first cigar to market using this wrapper. The blend is all Nicaraguan, specifically designed to accent this special wrapper. Medium to Medium-Full in body, this blend is all about flavor, just like the wrapper. At a price point of $8-$10, we believe this will set a standard for being “Consumer Price Conscious” at such a premium level.